Its advanced design and unique features make Crown the smallest, most effective, most reliable and best designed water softener in the world. While Crown uses ultra-fine resin beads to speed up the regeneration cycle, its dual cylinder design cuts wastage and maintenance costs. Beads in one cylinder can self-regenerate using softened from the other, keeping valves free of lime scale damage, while the other online cylinder keeps up the continuous household supply. It doesn’t matter how much your water consumption varies, your Crown unit won’t need adjusting – even if you go on holiday. That’s because the water flow is accurately measured automatically, so only the right amount of salt is used at any time. Crown uses a purpose designed block salt which comes in an easily handled size that’s more convenient to load and store. When the block needs replacing, the unit’s removable salt lid gives very easy access. So economical – but so effective! 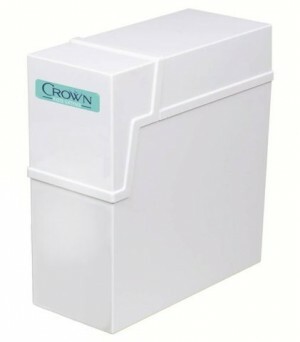 Although the Crown water softener is very compact, it’s clever side-valve design allows for maximum softening capacity. So for a system that takes up little space, works unobtrusively, doesn’t need electricity supply and virtually looks after itself – it’s quite a performer! Did you know that you live in one of the hard water areas of the UK? Water softeners work by removing excess minerals from your hard water supply with a special ionising process that uses pure salt water – no chemical additives are involved. With one simple, hassle-free installation you can enjoy a constant stream of naturally softened water that makes a big difference all around your home. his simplified cut-away diagram shows how Crown’s unique twin cylinder duplex parallel design works. You never have to wait, the softener never has to stop, you always have soft water – exactly when you want it. British designed, built, tested and approved – quite simply, light years ahead of everyone else!